Do you have a tendency to compare yourself to others? Everyone does. Humans have a natural desire for competition. If this weren’t true, then sports wouldn’t be as popular as they are. While you should never compare yourself to anyone for various reasons, it is interesting to know how you compare to your cohort. So how strong are you compared to the general population? In today’s post, we will go over realistic strength standards for both men and women. Let’s see how you stack up. First, I want to start with a disclaimer. There is no level of strength that you have to be. If you are content with your body and your strength levels, then you already are as strong as you need to be. Never compare yourself to someone else in the hopes of being as strong as they are. You have your own strengths and your own weaknesses. The purpose of this post is for you to measure how strong you currently are, relative to how strong you can become. With that said, if you want to optimize your body’s capabilities, then there is a bare minimum strength standard that you should set for yourself. I believe that everyone should strive to get as close to an Optimal level of strength as possible. – So that you can pull yourself up from a cliff if you happen to be hanging off a ledge somewhere while on vacation. – So that you carry lean muscle mass on your frame and decrease your risk of preventable illnesses. You can aim to go above the Optimal level and reach the Advanced and Athletic levels, however, these levels of strength will begin to have diminishing returns. If your goal is health and fitness, you only need to cross a certain threshold of strength to maintain a healthy body. Achieving an Advanced or Athletic Strength level is simply a matter of hobby. 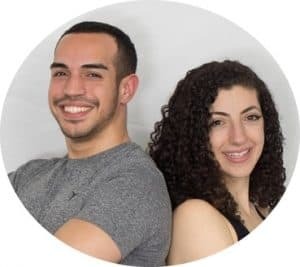 Brittany and I personally love strength training and do our best to go above and beyond what would be an acceptable level of strength for the average individual. How Strong Am I? How Should I Measure My Strength? It is important to note that this article is referring to strength standards for the major compound lifts that we discuss in Every Fitness Training Program Must Include These 3 Things. Compound exercises are the best method we have of measuring total body strength as these movements allow you to express the maximum amount of power your body can generate as a unit. For the major barbell exercises, the strength standard will be expressed as a one rep maximum. A 1 rep max is the most amount of weight that you can safely lift (with good form) one time. For the body weight exercises, the strength standard will be expressed as the maximum number of repetitions you can perform in one unbroken set. The standards presented below are not going to qualify you for the Powerlifting Championships. These numbers are realistic benchmarks that the average busy professional can expect. For the sake of simplicity, we will not stratify each strength standard by bodyweight. Instead, we will provide an absolute strength number and a relative strength number. The relative standard automatically takes your body weight into account. Both are provided because relative strength is not a perfect calculation. A lighter individual will always have an easier time developing their relative strength over a heavier individual. So without further ado, let’s get to the numbers. The squat is often regarded as the king of all exercises. It is performed with a barbell on your upper back, and it requires you to squat down to below parallel (your hips are below your knees when looking from the side). Having a strong squat allows you to maintain your ability to sit and rise from a seated position, and it strengthens your entire core and lower body musculature. Here are a few other reasons why you should squat. Want to know how to do it correctly? Check out our How to Squat Correctly and Safely Tutorial to see a full written description of this exercise. The bench press is the king of upper body barbell exercises. This is the upper body exercise that allows you to lift the most amount of weight possible. A strong bench press allows you to push items away from you while maintaining a stable shoulder position. Check out our How to Bench Press Correctly and Safely Tutorial to see a full written description of this exercise. How Much Should I Be Able To Deadlift? There are two kinds of lifters in this world. Those who love the deadlift, and those who hate it. If done correctly, you will feel the deadlift in almost every muscle in you body. The deadlift should be your strongest exercise. It is the movement that allows you to lift the most amount of weight possible. Having a strong deadlift is beneficial because it will allow you to maintain a healthy spinal position when lifting items off of the floor. 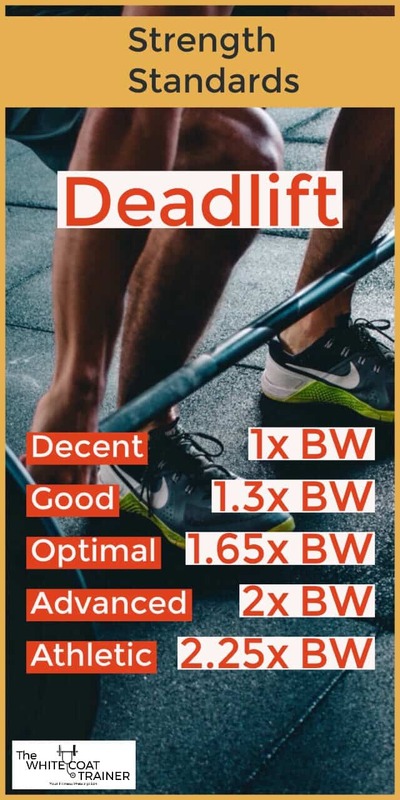 Check out our How to Deadlift Correctly and Safely Tutorial to see a full written description of this exercise. How Much Should I Be Able To Overhead Press? 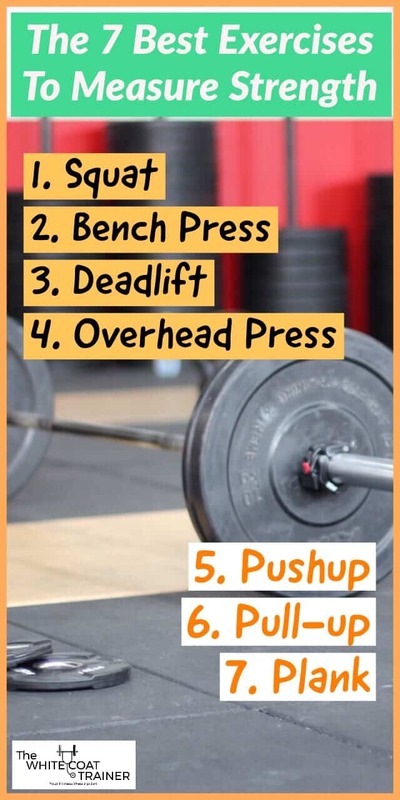 Out of the four barbell exercises, the overhead press is the one where you will lift the least amount of weight. It requires you to bring a barbell from your shoulders to a complete overhead position without the use of momentum. As simple as it sounds, it requires a lot of focus, strength and dedication. 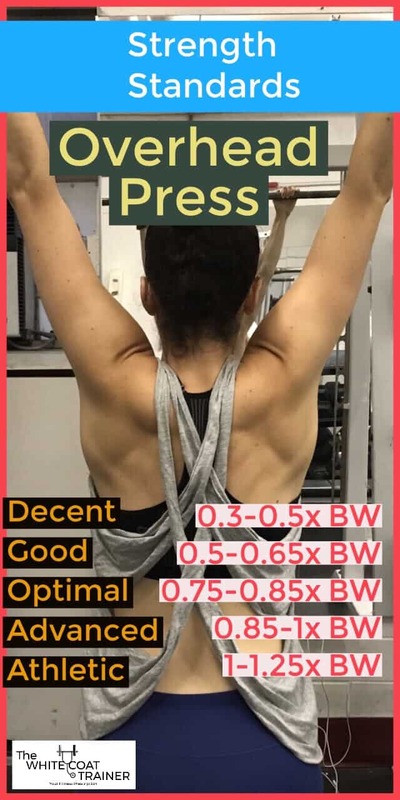 Check out our How to Overhead Press Correctly and Safely Tutorial to see a full written description of this exercise. What if you don’t know what your one rep max is? There is a very simple calculation you can perform to estimate that number. I don’t know who came up with it, but Jim Wendler’s 5/3/1 is the first place I saw it. For example, let’s say you lift 185 lbs for 5 reps. I have found that the formula is fairly accurate +/- 5-10 lbs. However, it does become less accurate with an increasing amount of repetitions. Ideally, you should only use 6 reps or less when doing your calculation. These strength standards have been created with symmetric strength in mind. To achieve your most optimal body, it is important to have a good baseline level of strength in all of the key functional movement exercises. 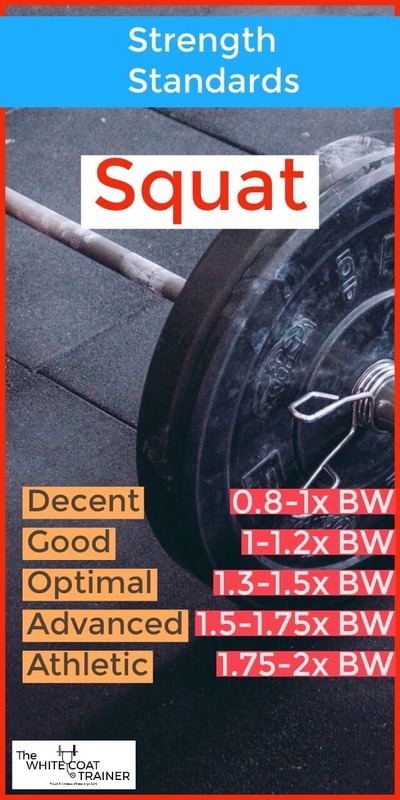 To optimize the health of your body, you should be able to squat and deadlift ~1.5x your bodyweight, bench press ~1.25x your bodyweight and overhead press ~0.75x your bodyweight. However, it isn’t enough to be able to lift heavy weights. You should also be able to move your own body around too. What about the core bodyweight exercises? What is the optimal amount of pushups or pull-ups you should be able to do? How long should you be able to hold a plank for? Here is what you should be able to do in an ideal situation. How Many Push-Ups Should I Be Able To Do? The pushup is long regarded as one of the best markers of upper body strength. If you cannot do a single push-up, then you really have to start getting things back in order. We have created an entire 10 Step Push Up Progression that you can do at our 30 Day Exercise Challenge For Busy Professionals. How Many Pull-Ups Should I Be Able To Do? The pull up is probably one of the most difficult exercises of all time. Most people cannot perform a single pull up. This is unfortunate as the pull up is the king of upper body exercises. Don’t worry, you can still benefit from this exercise by performing negative pull ups which we describe in detail in How To Do Pull Ups Correctly and Safely. How Long Should I Be Able To Plank? The plank is by far the best core exercise there is. It is so simple, yet so effective. Ab exercises should rarely involve excessive movement of the spine. And if you are still doing sit-ups, please stop. You must be able to hold a plank for at least 1 minute if you want to have a healthy body. This is certainly doable compared to what others have done. I hope that these numbers have motivated you (and not discouraged you) to achieve optimal levels of strength. Now is as good a time as any to set and achieve whatever weightlifting goal you desire. Don’t worry. 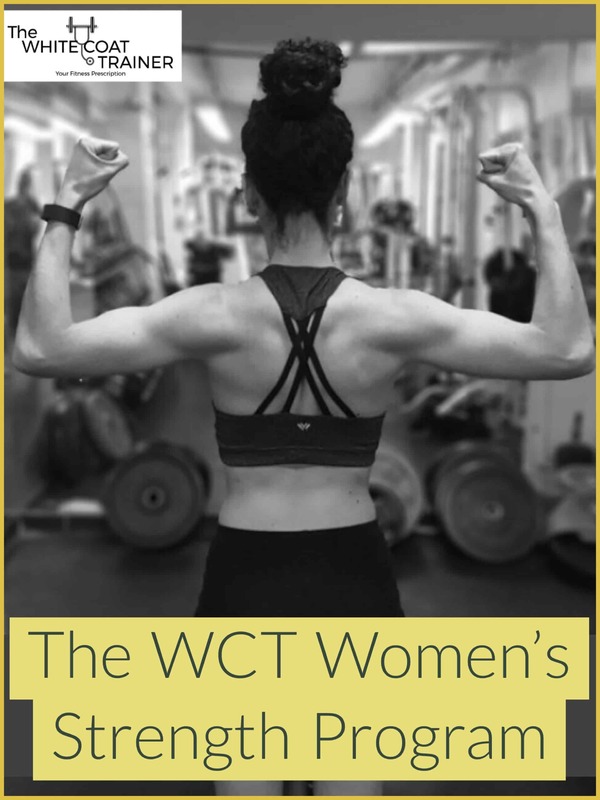 This is why we have created The WCT Strength Program For Busy Professionals. It is a 15-week training program designed to get you results fast, while minimizing the time you need to spend at the gym. There are both male and female options. In addition, you can also check out The Best Workout Template For Busy Individuals. In this post, we discuss all of the necessary components any training program should have, all with an emphasis on the big 4 exercises as well as some other honorable mentions. What do you think of our bench marks? 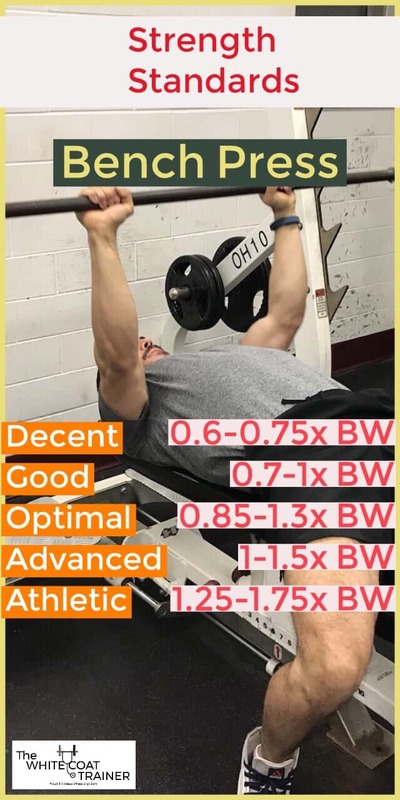 Are you close to the optimal bench marks? Do you see yourself accomplishing these goals? Any other standards you would add to the list? Yes but, what do you do when you can’t even bench 0.5x bw? Begin a strength training program using the appropriate amount of weight you can safely lift and work on getting stronger week by week. The good news is, its fairly easy to make progress in the early stages of training! I like the list. Very simple and realistic standards for 99% of the population. I have seen a trend recently (I blame youtube/social media) where these standards haven’t gotten way too high. I hear people talking about 500lb deadlifts like anyone should be able to hit that. Yeah anyone who wants to compete nationally in power lifting but the specificity and time required to hit that number just isn’t realistic for most. Only thing I might add to the list is a dead arm hang and perhaps a horizontal pull test. Maybe Barbell Row or inverted feet elevated rows. And I’m advanced or athlete in all the categories. Gives me some good guides to help balance me out. 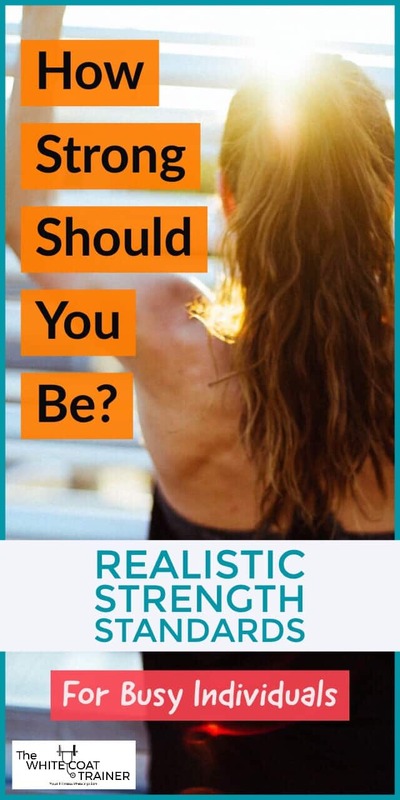 I totally agree with you.Other strength standards that you see across the internet have powerlifters or strength athletes in mind, and are way too unrealistic for the general population. Once you cross a certain strength threshold, any further increase in strength is more for fun, and not for health. Good idea about the dead hang. Many people argue that grip strength correlates well with overall health. Hello, nice article. I did just want to point out that the formula for 1RM should be 0.0333 and not 0.333. The way it is written currently gives an outrageous 1RM. Thanks David. I just fixed it! Finally some real standards. I work out probably a bit more frequently and a bit harder than the average guy at the gym that goes sometimes, thats about it. According to another natural standards chart that is considered to be "Realistic", I am supposed to Squat 465lbs, deadlift 465lbs, and bench 370lbs in order to be "Decent" defined as, "probably requires 6-12 months of training". I think these people are just living in a different world, surrounded by olympians and strength coached 4 hours every day. I am optimal/advanced in most of these categories, and it took me a hell of a lot of time and energy to get there at 180lbs. Hey Jorge,I agree. 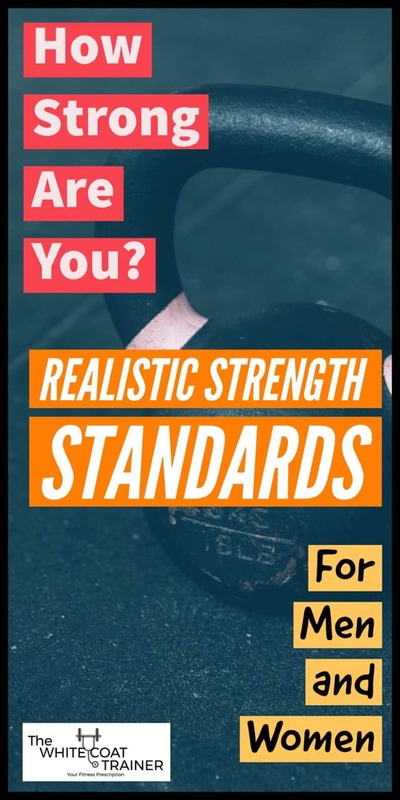 Those other standards just aren’t realistic for the general population. As I mentioned, going past optimal/advanced levels is only a matter of hobby and not for health.